4:08 PM: Federal authorities have unsealed a criminal complaint in San Francisco today alleging charges including drug trafficking, gun running, money laundering and murder for hire against 26 people, including state Sen. Leland Yee. The Federal Bureau of Investigation arrested Yee this morning, along with infamous Chinatown gang leader Raymond “Shrimp Boy” Chow. Chow is the president of the Supreme Lodge of Chinese Free Masons in San Francisco. According to the U.S. Attorney’s office, Chow’s criminal rap sheet dates back to the 1970s, and includes previous convictions for racketeering, drug trafficking, attempted murder, arson, robbery, gambling and extortion. The complaint unsealed today alleges that between 2012 and 2014, Yee offered to use his office to do favors for undercover FBI agents in exchange for money that would fund his Secretary of State campaign. The U.S. Attorney’s office says one instance of such an offer happened after Yee lost the November 2011 election for mayor of San Francisco. In an effort to retire at least $70,000 in debt accrued during the campaign, authorities say Yee agreed to help push a contract under consideration with the state Department of Public Health. He allegedly called a manager at the department, and sent an official letter in support of the contract, which was to benefit an undercover FBI agent. In exchange, authorities say Yee accepted a $10,000 campaign donation. Official charges against Yee include six counts of attempting to defraud citizens of honest services, and conspiracy to traffic in, and illegally import firearms. Maximum penalties for the firearms charges include 10 years in prison and $500,000 in fines. Penalties for each of the fraud charges could carry a penalty of 20 years in prison, and a $250,000 fine, according to the U.S. Attorney’s office. Yee represents Senate District 8, which includes the western half of San Francisco and most of San Mateo County. He declared his candidacy for secretary of state in 2012 when his term in the state senate was up, and he was on the ballot for November’s election. 1:09 PM: State Sen. Leland Yee and an infamous Chinatown gang leader were arrested this morning by the Federal Bureau of Investigation as the agency executed numerous raids and arrest warrants throughout the Bay Area, an FBI spokesman said. One of the warrants was served at the Ghee Kung Tong Supreme Lodge in San Francisco’s Chinatown, which houses the Chinese Freemasons of the World at 36 Spofford St., FBI spokesman Peter Lee said. Among the arrestees was also Raymond “Shrimp Boy” Chow, the president of the Supreme Lodge of Chinese Free Masons of the world in San Francisco, who has a lengthy prior criminal history dating back to the 1970s and connections to Chinatown-based gangs. Chow was arrested at the lodge, Lee said. Yee is scheduled to appear before a U.S. Magistrate Judge Nathanael Cousins this afternoon at 1:30 p.m., Lee said. FBI agents were at the Ghee Kung Tong building throughout the morning and were expected to bring down materials and equipment over the next several hours, FBI Special Agent Michael Gimble said. Uniformed agents were leaving the red building throughout the morning, with some of them carrying bulletproof vests in their hands. At around 11:30, a small group of San Francisco firefighters brought into the Ghee Kung Tong building a circular saw and a hand-held Jaws of Life tool. They declined to offer details on why the equipment was needed. Yee represents Senate District 8, which includes the western half of San Francisco and most of San Mateo County. He has declared his candidacy for secretary of state in 2012 when his term in the state senate was up and was on the ballot for November’s election. A two-time San Francisco supervisor who also served on the school board, Yee lost his run for San Francisco mayor in 2011, finishing fifth. Chow has a lengthy criminal history. He was convicted of six gun charges in federal court in 1995 and sentenced to 23 years in prison. He was the leader of a criminal faction of the San Francisco social club called the Hop Sing Tong, which started as a national business association of Chinese immigrants in the 19th century. Chow’s criminal history started early, and by age 16 he was the leader of 30 underlings collecting money from gambling dens in Hong Kong. After coming to the U.S., he organized the Hop Sing Tong to collect money from gambling dens in San Francisco. He was arrested on robbery charges in 1978, paroled in 1985, but quickly returned to crime and was sent back to prison. Chow testified in the 2002 trial of Peter “Uncle” Chong that he was Chong’s right-hand man when Chong was head of the Wo Hop To criminal organization after Chow’s Hop Sing Tong gang merged with Chong’s to take over Chinatown’s criminal activity in 1990. 11:45 AM: State Sen. Leland Yee was arrested this morning by the Federal Bureau of Investigation as the agency executed numerous raids and arrest warrants throughout the Bay Area, an FBI spokesman said. 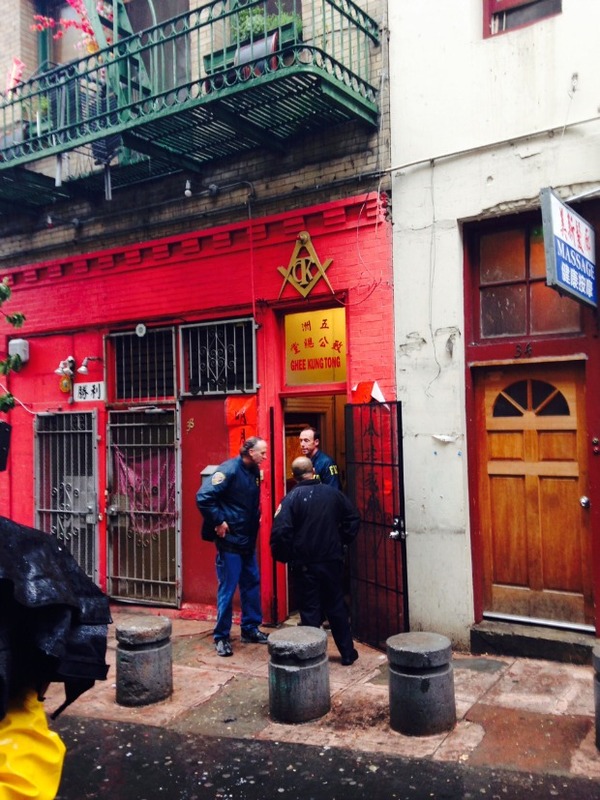 One of warrants was served at the Ghee Kung Tong Supreme Lodge in San Francisco’s Chinatown, which houses the Chinese Freemasons of the World at 36 Spofford St., FBI spokesman Peter Lee said. Among the arrestees was also Raymond “Shrimp Boy” Chow, who has a lengthy prior criminal history dating back to the 1970s and connections to Chinatown-based gangs. Chow was arrested at the lodge, Lee said. 11:13 AM: The Federal Bureau of Investigation is executing numerous search warrants and arrests in the Bay Area this morning including in the Ghee Kung Tong Supreme Lodge in San Francisco this morning, an FBI special agent said today. FBI Special Agent Michael Gimble could not confirm the raids were related to the arrest of state Sen. Leland Yee. Agents are expected to bring down materials and equipment from the lodge building that houses the Chinese Freemasons of the World at 36 Spofford St. over the next several hours, Gimble said. 11:01 AM: Five uniformed agents with the Federal Bureau of Investigation left the Chinatown’s Ghee Kung Tong Supreme Lodge in San Francisco just after 10 a.m. today. One of the agents carried a bullet-proof vest in her hands as she exited the red building that houses the Chinese Freemasons of the World at 36 Spofford St.
An official with the FBI walked into the building thereafter to “assess” the scene, but could provide no public comment as to the specific nature of the activity. Media reports indicate this activity is linked to the arrest of state Sen. Leland Yee, who was allegedly taken into custody this morning on suspicion of public corruption charges.